April 26, 2018, © Leeham News: Airbus Ultra Long-Range version of the A350-900 took off for the first time Monday. 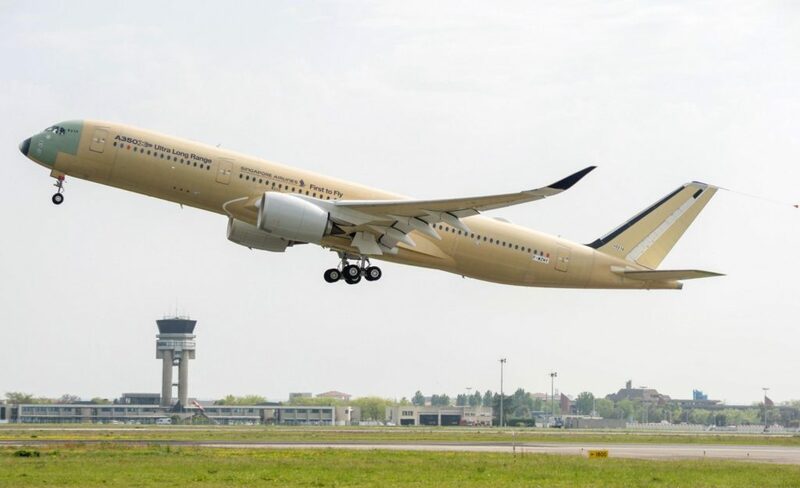 The aircraft will conduct a short flight test program before being painted in Singapore Airlines’ colours and handed over after the summer. Airbus touts the A350-900URL as an aircraft which can fly ultra-long routes with flight times up to 20 hours and distances of 9,700nm. So, what so different with this aircraft to the normal A350-900? We use our performance model to show where the differences are. The A350-900URL has got a higher fuel capacity to extend its range when used as an Ultra Long Range aircraft when loaded with fewer than 250 passengers. At the passenger counts where Singapore Airlines will operate the aircraft, the additional range is about 1,000nm. For normal operations, there would be no gains.